Sula Framing and Gallery quickly gained recognition as being one of Guernsey’s foremost picture framers, providing conservation quality framing work at very reasonable rates, and for exhibiting quality art-work. Sula's art gallery developed a reputation for exhibiting quality original artworks, with many pieces being of local interest. Located within the former Salem Methodist church at, L’Islet, St Sampson at the junction of Sandy Hook and Route Carre. The large bright and airy building offers beautiful gallery space, a large framing workshop and ample customer parking. Whether you are an internet customer or visiting our gallery in person, we will always try to make your experience with Sula as enjoyable as possible. Disabled access can be arranged, please call 01481 245396 on arrival as there is an alternative entrance without steps. Sula Gallery displays and sells a huge array of original artwork in various media. Works by local artists including Hayley Bachelet Sula’s Co-owner who has a BA (Hons) in Textile Design, sit alongside other local, national and international artists work. 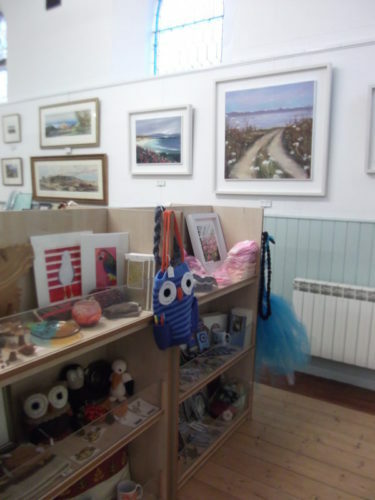 Beautiful locally made craft items, handmade infant knit ware, knitted blankets, jewellery, cards, local interest books, art prints etc., with more lines constantly being added. Gallery space can be reserved for bespoke exhibitions with reasonable commission rates. Workshops and evening craft groups such as knitting, spinning, weaving etc. are also held. All Sula’s picture framing work is undertaken with the same high degree of care and attention, using only conservation or museum quality mounts and barriers. In addition to our private customers, we also carry out work for the Guernsey Museum and Art Gallery, Government House, The Guernsey Arts Commission, The Royal Court, and many businesses. Work framed by Sula will not only look fantastic but conserve your artwork for many years to come. We carry a comprehensive range of frame mouldings and mounts to suit a wide variety of tastes, and welcome enquiries from all sectors of the private and business community. Whatever you’re framing requirement we can help, and you are assured a friendly welcome. No job is too big or too small.